It will come as little surprise to readers here that businesses this year have been getting increasingly serious about social media as they find that their customers are spending a rapidly growing amount of time there. The most recent numbers show that Americans are spending nearly a quarter of their online time in social networks, far ahead of other forms of Internet activity. The numbers worldwide aren’t much different and implications for businesses are many and varied. I’ve explored these extensively before and it goes well beyond such ideas like “Facebooking” the enterprise. Yet due to the top-down way most organizations operate, businesses continue to fall behind what’s happening in the marketplace today. Unfortunately, the underpowered, non-scalable, expensive, and fundamentally limited value creation techniques of yesteryear won’t begin to suffice in today’s rapidly emerging Social Business landscape. Even as organizations have strategically started to embrace social business, the global changes driven by widespread social computing are still ongoing. A confluence of large scale behavior change and co-evolutionary Internet-based technological progress are driving important new trends in 2010. While some of these are somewhat early stage, a few are more advanced and nearly upon us. By and large, most of these are still under the radar of enterprises today. Yet each of these trends highlight key developments that will be absolutely essential for businesses to succeed in the very near future. Make no mistake, the future of business is now tied directly to whatever strategies and techniques work most effectively in a profoundly connected society. It’s a world where knowledge is not only already produced primarily using social media but is instantly findable, accessible, virtually free, and superabundant. Thus, as businesses seek to address the disruptive challenges of social media using Social Business, anticipating what comes next will be an essential exercise. Value creation shifting from workers to outside the enterprise. Anyone who has been involved in social media understands that they personally are just part of a much larger ecosystems of conversation, innovation, and participation. So goes it with the enterprise. In this new world success is defined by how well you can connect with and tap into the global network, both for obtaining value and delivering it. And to be perfectly clear, I am not saying that all value is going come from outside of enterprises in the future, far from it. But in general, organizations are now greatly outnumbered by the resources on the network and real business value is increasingly coming from the social world as we learn how to participate in it. I’ve tracked major trends in this area such as crowdsourcing, open and social supply chains, and other closely-related practices such as social media marketing and Social CRM as ways to apply Social Business to greatly amplify and transform what your organization does. The lesson here is that the network will always greatly outnumber you, so you must enlist it to participate in objectives everyone jointly values. The good news: Organizations are starting to listen this year. Business processes as opt-in community-powered activities. Social engagement promotes openness and builds community. Today’s workstreams are becoming ever more social and can tap into a wider and wider pool of inputs and contributors. Trends like Enterprise 2.0 are starting to put the tools that make this possible into millions of workers hands. Now it’s up to organizations to ensure that organizational support and social media literacy is in place to deliver on the potential. The fact is, however, today’s business processes are mostly still closed, private activities between obscurely identified groups of people that happen largely inside little known silos of organizations. Not only are the processes themselves typically isolated and often disconnected from ground truth and many of their key stakeholders, but as the open source world discovered a decade ago, there are just too few eyes to ensure they are doing what needs to be done and in the best way possible. While the success stories of open innovation and other open business models have started to pave the way, only now are we seeing organizations realize the value of community-based processes conducted in the open and with network effects by default (everyone’s contribution creates observable value, large or small). While Social CRM is probably the lead exemplar this year of how to turn general purpose social activity into community-powered transactions that are focused on specific business outcomes, there are now many other emerging areas where social media is directly informing business processes for the better. Mobile experiences as the primary social channel. The latest June, 2010 research from Morgan Stanley’s Mary Meeker and team tells the story here. The mobile Web is currently experiencing unprecedented growth in use. The iPhone and Android platform in particular are fundamentally changing the game when it comes to our new usage of mobile Web applications. Notably, this includes providing powerful monetization and usage safety nets that are very attractive to both consumers and the businesses that want to engage with them. As importantly, smartphone shipments are now expected to be greater than notebook and PC sales combined by 2012. When coupled with the sea changes taking place in social (the Morgan Stanley deck also provides the Comscore data I’ve cited in the past that shows how Web communication is now led by social networks), and you have a social computing revolution that is going mobile. This new mobile reality is based on smartphones, with all their unique capabilities such as location awareness, video/audio capabilities, and arrays of other sensors. In other words, most businesses need a plan for a near-term future where most interaction with workers, partners, and customers is through task-specific and social applications on mobile devices with all their attendant strengths and weaknesses. Business engagement driven by social analytics. Any business processes that runs without a closed feedback loop is almost always going to underperform. It’s only through sustained contact and understanding of the marketplace that engagement can succeed. Much of the world has now migrated from the familiar, well-known places to interact and gone elsewhere, to new social environments. There are hundreds of social networks with a combined audience of over 1 billion users today. Beyond the Internet, there are many private social environments that exist within most organizations today (even if it’s just local e-mail.) Given that social networks are increasingly open and, well, social, and you have the unique, generational opportunity to actually understand what’s happening, what’s known, and who knows it, all in near real-time. How can this accumulated knowledge be used to drive business goals? Without tapping into what we would call the dynamic signal, there’s no way to know. Mining the collective intelligence of the social Web or an enterprise network is a tall order but there have long been concerted efforts to do so, with a growing number providing meaningful, actionable approaches. Whether it’s finding new ideas, identifying important trends, measuring sentiment, supporting customers, or whatever it is that needs to be done, keeping track of the galactic conversation still isn’t easy. 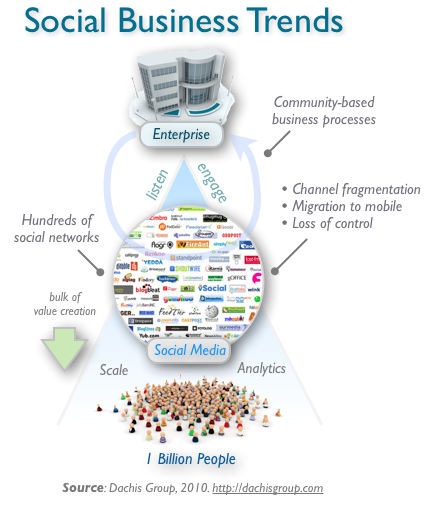 However, the good news this year is that the tools and techniques of social analytics that deliver results are emerging, such as WebTrends’ Social Measurement capabilities, Infegy’s Social Radar, or the growing interest in enterprise social analytics for performance management, as just three examples of many. Starting now, businesses must deeply access, understand, and react intelligently to all the important currents of activity that affect them across the social universe. Engagement strategies that scale across all important social channels. Listening to the social universe, both outside as well as within the enterprise, and then developing a desired response can be readily achieved by most organizations today. But effective delivery of that response across the myriad social channels that exist is another challenge entirely. Fortunately, we are beginning to see approaches that can aggregate and scale out to the large number of channels and people in today’s massive social environments. For example, companies like Radian6 and GetSatisfaction are already providing some of the capabilities to scale social media engagement and community management as widely and deeply as it must be done today. Scale has become the signature business challenge of social media and will be for the foreseeable future, whether that is the explosion of knowledge when workers engage in Enterprise 2.0-style activities or being a part of the hundreds of millions of daily social media conversations taking place on the Internet. Creating strategies, infrastructure, and processes to deal with this is what I am seeing organizations working on around the world this year. Anticipating and designing for loss of control. At this year’s Enterprise 2.0 Conference in Boston, my friend and colleague JP Rangaswami delivered a terrific opening keynote where he dropped the phrase that became a hot topic of conversation for the rest of the week. In his keynote, he talked of the necessity of enterprises today needing to “design for the loss of control.” A combination of Web access, SaaS, cloud computing, social software, and smartphones that are more powerful than many laptops are leading to a world where anyone can access the IT solutions they need to get their work done and don’t need any permission to do it. Enterprises currently expend considerable resources trying to impose control on a situation that increasingly appears like it not only can’t be controlled, but almost certainly doesn’t need to be. The level of control being imposed over IT today is excessive, counterproductive, and undesirable from a business results standpoint, the argument goes. Routing workers away from the applications, social networks, and devices that they clearly prefer to use is a strategy that, like most modern urban conflicts, is almost certainly a losing proposition in the long run. Instead, focusing on enabling the safe and effective use of cloud-based solutions that fit local problems, leveraging workers’ growing social capital and their own mobile computing devices can be looked at as just another form of outsourcing. In other words, letting go of non-essential control will be a key success factor for Social Business leaders going forward. Certainly there are still real challenges to doing this but the point is that the opportunities are certainly significantly greater than the cost. Together, we must learn how to fix IT in the Social Business era. I’ll be tracking these trends and other important ones we’re beginning to detect in the coming months. What is becoming abundantly clear is that we’re seeing a major inflection point this year with social computing that made the original uptake a couple of years ago look like a niche trend. This also means that the next generation of products and services must be deeply informed by these pervasive trends, and therefore seeing deeply into, understanding, and responding to their implications will be the key hurdles for most organizations. What other trends are you seeing in Social Business today? Please add your ideas and insight in the comments below. What a fantastic post you’ve got here. Truly, I think this is one of the most insightful pieces I’ve read in quite awhile about the path social business is taking. I’m fascinated by your comments regarding mobile being so important to the social business movement. The things that become so engrained in our lives — like mobile technologies — are the pieces of social that will be most valuable to recognize and account for in our business processes. The key, then, is keeping an eye out for those bits, because we easily skim them over in our day-to-day tasks. You folks are leading the charge here. Wonderful insights that have got me thinking, and thank you so much for the Radian6 mention, as well. Really interesting article Dion. You say, “…today’s business processes are mostly still closed, private activities between obscurely identified groups of people that happen largely inside little known silos of organizations.” While I could cite numerous examples of companies who are starting to “get it,” generally I couldn’t agree with you more. At Adobe, we are trying to help companies crack open this unfortunate truth. Contrary to where a lot of businesses are today, the world is moving towards completely digital experiences, where the Web offers frictionless access to services and products. Traditional enterprise software cannot compete or thrive in an era where people expect to conduct business (but can’t) with easy-to-use applications that behave like Facebook, Twitter or an intuitive mobile OS. We have seen that processes designed with the end user in mind can resuscitate legacy systems into powerful solutions that drive enterprise profitability and brand loyalty. We’re getting there but indeed there is a long way to go. I’d also add another trend – that patterns of consumer adoption are being echoed within the enterprise. While this has been coming down the pipe for some time, it echoes Trend 1 – value creation outside the enterprise – and is manifesting as endorsed practices. So rather than having to “make the case” for a social business practice, our challenge now is to demonstrate/prove out the model from an operational point of view.